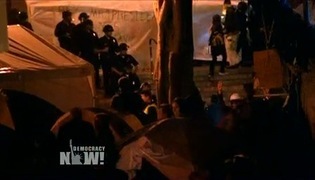 Police Crackdowns on Occupy Protests from Oakland to New York Herald the “New Military Urbanism” | Democracy Now! professor of Cities and Society at Newcastle University in the U.K. His most recent book is called Cities Under Siege: The New Military Urbanism. NERMEEN SHAIKH: Before dawn on Monday morning, hundreds of police in riot gear raided the Occupy Oakland encampment in order to evict peaceful protesters. It was the second time the police had evicted protesters. A similar raid was conducted on October 25th. On Monday, more than 30 people who chose to remain as an act of civil disobedience were arrested. Later in the day, Mayor Jean Quan’s chief legal adviser resigned over what he called the, quote, “tragically unnecessary” police raid. AMY GOODMAN: I visited the campment on Sunday, prior to the raid. It was a peaceful Sunday morning. One of the people who happened to be right in front of Oakland City Hall at the Occupy Oakland encampment talked about why he was there. ALI: My name is Ali. How are you all doing? AMY GOODMAN: Hi. Have you been here from the beginning? ALI: Pretty much. Pretty much, yeah. AMY GOODMAN: And what do you want to see happen here? ALI: Well, there’s a lot of things. You know, I’m from Oakland, you know what I’m saying? So that, for me, to see changes, it’s not a Wall Street thing, it’s not a bank thing, but it’s a social thing. You know what I’m saying? Everything that’s been going on in Oakland—the homicides, schools being closed down, libraries being shut down, teachers being cut off, public workers getting laid off, work furloughs—everything that the city is supposed to be taking care of its own is not being done. You know, that’s what I’m here, is trying to get them to start taking care of us as a people in Oakland, California. I mean, this is minute. You know, this is a small thing right now, if you look at it from Oakland’s perspective, OK? But this is not small: we are a role model for the whole world. And that’s what’s going on. AMY GOODMAN: And how are the police dealing with this at this point? ALI: Can I—can I be frank? I don’t care. I want to say it in different words, you know, but I just—I don’t care, you know, what the police think. I don’t care what Mayor Quan think. I don’t think what any politician think about what we’re doing here, because what we’re doing here is starting something new, you know what I’m saying? I don’t deal with any type of politic situations or none of that. What I’m dealing with is this encampment of Oscar Grant Plaza, OK? That’s the only thing. That’s the only my concern. AMY GOODMAN: And why is it called Oscar Grant Plaza? ALI: I mean, you know, it’s a representation of what’s been going on in Oakland, California, for a long time, with the oppression of poverty here, of the people of the community of Oakland, OK? Oscar Grant was a young male who was pretty much handcuffed on a BART train with a 250-pound officer on his back, six-four, OK? While he had another officer on his neck. And the officer pretty much pulled a gun and shot him in the back, while he was still in handcuffs, laying down on the platform on his stomach. So how—I don’t understand the threat in that, OK? And that’s the threat of these corporations on our society and our community. It represents that. We are all in handcuffs. We are all on our back. We have no way of getting out of it. And they pretty much have got these guns on our back, and they’re shooting us. It’s a representation of a whole. AMY GOODMAN: And what do you think this encampment has accomplished? How long has it been out here? ALI: I mean, you know, this encampment has accomplished a lot, OK, for myself and—you know, we have discussions all the time, you know what I’m saying? And it comes to what society labels us as, you know? And this right here, this encampment, has given the people a chance to change what those labels are, you know what I’m saying? Whether you’ve been called a black man who’s a criminal or a Hispanic who’s a car thief or an individual who’s a racist, this is a place where none of that exists, OK? Because if you come with those, you’re going to have some type of change. OK? And pretty much what I’ve seen happen here, because this is our own world, our own community, our own society, that’s by the people, we feed people, OK? We house people, OK? Not just people, but families, as well, you know what I’m saying? These people, if you go around West Oakland, the homeless encampments all across West Oakland are pretty much here. They are a part of the society, and they have to be recognized that they are here. You know what I’m saying? But everybody here is not a homeless individual. Some of us are hard-working class. You got these homeless people, crack addicts, heroine addicts, disabled people, right along with the same people that are doctors, lawyers, practitioners, chiropractors, teachers. We’re all here together, OK? We are parents. We are mothers, fathers, brothers, sisters. Everything here is together, no matter what label you put on us. You know? I’m a criminal. I’m a thug. I’m a convict. I’m a gangster. I’m a womanizer. But you know what? That’s what society labeled me as. This society—I’m not none of those. I just met these people right here, you know? I just met you guys. Do you guys consider me as a thug or a criminal or anything? ALI: There we go. You know what I’m saying? And that’s what’s been going on in society is that we have these labels upon ourself, living in these low-income areas. And pretty much like I was saying is that we need to start showing the people. AMY GOODMAN: That was Ali at Occupy Oakland on Sunday morning. Within 24 hours, the encampment was raided, scores of people arrested. Oakland Mayor Jean Quan admitted in an interview with the BBC that she and leaders across various cities around the country experiencing Occupy protests, well, participated in a conference call. MAYOR JEAN QUAN: I was recently on a conference call of 18 cities across the country who had the same situation, where what had started as a political movement and a political encampment ended up being an encampment that was no longer in control of the people who started them. And what I think you’re starting to see is that the Occupy movement is looking for more stability. I spent a lot of last week talking to peaceful demonstrators, ones who wanted to separate themselves in my city away from the anarchist groups who had been looking for a confrontation with the police. NERMEEN SHAIKH: Well, as police forces violently crack down on protesters across the United States and Europe, we turn now to an author who looks at the increasing influence of military technology on domestic police forces. Stephen Graham is professor of Cities and Society at Newcastle University in the U.K. His book, Cities Under Siege: The New Military Urbanism, looks at the links between military counterinsurgency tactics deployed in war zones abroad and the methods of surveillance and control increasingly used in urban areas around the world. Stephen Graham, welcome to Democracy Now! Could you say a little bit about what the significance of your findings in the book were regarding the Occupy movements, in the U.S. particularly? STEPHEN GRAHAM: Yes, well, the book really tries to look at the ways in which police forces are increasingly using sort of military ideas and military tactics at the domestic scale to confront particularly mobilizations in cities, such as the Occupy movements that we’re talking about here, and how those tactics and ideas and, increasingly, technologies have very close links, very big security-industrial complexes, to the moves in the military towards a really intense focus on cities and on counterinsurgency tactics in sort of war zone cities such as Baghdad and Kabul. NERMEEN SHAIKH: In a CNN article that appeared yesterday, the author talks to a police officer who reports that now the kind of equipment that’s accessible to the police includes machine guns, tasers, and also that larger and mid-sized police departments in the U.S. now have access to tanks. Can you say something about how this happened? STEPHEN GRAHAM: Well, there’s been a longstanding shift in North America and Europe towards paramilitarized policing, using helicopter-style systems, using infrared sensing, using really, really heavy militarized weaponry. That’s been longstanding, fueled by the war on drugs and other sort of explicit campaigns. But more recently, there’s been a big push since the end of the Cold War by the big defense and security and IT companies to sell things like video surveillance systems, things like geographic mapping systems, and even more recently, drone systems, that have been used in the assassination raids in Afghanistan and in Pakistan and elsewhere, as sort of a domestic policing technology. It’s basically a really big, booming market, particularly in a world where surveillance and security is being integrated into buildings, into cities, into transport systems, on the back of the war on terror. AMY GOODMAN: And then, talk about the issue of surveillance, whether we’re talking about how the Occupy movements are being watched, surveilled, monitored. Very interesting to hear Oakland Mayor Jean Quan say on the BBC that they’re coordinating—and they are coordinating with the FBI, they’re coordinating with Homeland Security—in dealing with these movements. So, talk about the surveillance apparatus, something you know very well from Britain, and name names. What are the corporations involved? STEPHEN GRAHAM: Well, there’s a whole variety of corporations linked to university research departments, linked to large-scale data-mining companies, linked to companies like Raytheon, who most people know of as making missile systems. Increasingly, they run border surveillance systems for things like the airline security and so on, which is a big thing in Europe and North America. But the key point really here is that surveillance is being used to try and track activist groups, permanently sort of monitoring them, using video systems, using database systems, and to allow infiltration. These are very much seen as movements that need to be infiltrated. In the U.K., there’s been a big scandal because of undercover police going into activist movements across Europe—green movements, social movements and so on—with a view to sort of basically being informers and spies to allow police to sort of crack down on what is effectively completely legitimate democratic activity. NERMEEN SHAIKH: What do you think the significance is, Stephen Graham, of the fact that protesters across the U.S.—and it’s been true in Europe, as well—are increasingly characterized as somehow criminal—drug addicts or sexual predators—or somehow a sanitation or a health hazard to the communities in which they’re protesting? Can you say a little bit about how this works? STEPHEN GRAHAM: Well, in the book and elsewhere—other authors are writing these things, too—I think it’s important to put this debate in the bigger context of how cities have changed. And cities in the last 20 or 30 years, particularly in North America, have become much more sanitized, much more controlled by questions of zero tolerance, by questions of really aggressive policing, to clear out those that are deemed to be sort of not fitting a model of urban life, which centers on consumption, which centers on business. So there’s been a really powerful shift in cities to sort of criminalize homelessness, to criminalize panhandlers, to criminalize those not seen to belong in this—what Neil Smith in New York has called the “revanchist city,” the city taking back spaces for the wealthy, effectively. That was very much Mayor Giuliani’s strategy. So, in a way, I think what the Occupy movement is so powerful at is demonstrating that by occupying public spaces around the world, and particularly these extremely symbolic public spaces, it’s reasserting that the city is the foundation space for democracy. And we have to reassert that symbolically and with the actual groupings of the activists in space. So the internet is not enough. It’s very much necessary to reassert that cities are political spaces which need to be used to mobilize social and political change. AMY GOODMAN: And you talk about how the population centers have so dramatically shifted, not only in the United States, but around the world, to the cities. And it’s that question we’ll end with, Stephen Graham. STEPHEN GRAHAM: Absolutely. Well, I mean, last year, we moved past the moment where 50 percent of the world was living in cities. By 2050, 75 percent of the world’s population will be living in cities. But too often, political and military power is controlled by people who see cities purely as threats, purely as sites of unrest, sites that need strong military and security control. And what’s so wonderful about the Occupy protests is that there’s a different, a much more hopeful idea of cities being pushed there, in a world where we have a really radical crisis and a radical sense of illegitimacy for the social model that we’re all still having to live under. AMY GOODMAN: Stephen Graham, I want to thank you for being with us. His book is called Cities Under Siege: The New Military Urbanism.